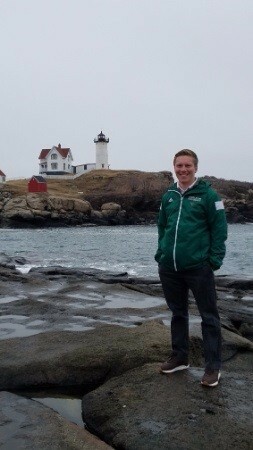 Castleton alumni Eric Horsfield has Spartan pride in every sense of the word. The Tolland, Connecticut native earned a Bachelor of Science in Sport Management in 2015 and served as an athletic administrative graduate assistant for two years, earning a Master of Science in Athletic Leadership in 2017. In August of 2017, Horsfield was appointed assistant director of NCAA compliance at his alma mater. As a student at Castleton, Horsfield took an active role throughout the athletics department. He interned alongside the athletic director. As a four-year member of the university’s lacrosse team, he was named to the North Atlantic Conference all-academic team. It should come as no surprise that Horsfield’s favorite memory of his time as a student at Castleton involves sport.